Abu Walid Mohammad Ibn Rushd, born in 1128 C.E. in Cordova, Spain, has been held as one of the greatest thinkers and scientists of history. 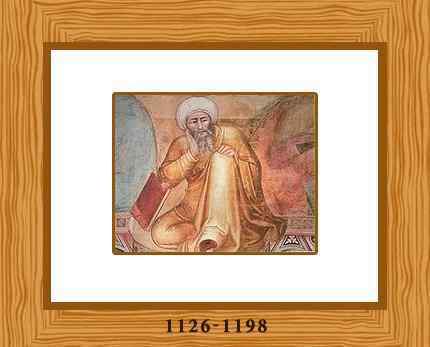 His name is often Latinized as Averroes. A product of twelfth-century Islamic Spain, he set out to integrate Aristotelian philosophy with Islamic thought. A common theme throughout his writings is that there is no inappropriateness between religion and philosophy when both are properly understood. His contributions to philosophy took many forms, ranging from his detailed commentaries on Aristotle, his defense of philosophy against the attacks of those who condemned it as different to Islam and his construction of a form of Aristotelianism which cleansed it, as far as was possible at the time, of Neoplatonic influences. Ibn Rushd’s education followed a traditional path, beginning with studies in Hadith, linguistics, jurisprudence and scholastic theology. Throughout his life he wrote extensively on philosophy and religion, attributes of God, origin of the universe, metaphysics and psychology. He excelled in philosophy and jurisprudence and was nicknamed “the jurisprudent philosopher.” The role of the philosopher in the state was a topic of continual interest for Ibn Rushd. His thought is genuinely creative and highly controversial, producing powerful arguments that were to puzzle his philosophical successors in the Jewish and Christian worlds. He argues that there are two forms of truth, a religious form and a philosophical form, and that it does not matter if they point in different directions. He is also doubtful about the possibility of personal immortality or of Gods being able to know that particular events have taken place. His work also suggests that religion is inferior to philosophy as a means of attaining knowledge, and that the understanding of religion which ordinary believers can have is very different and impoverished when compared with that available to the philosopher. In philosophy, his most important work Tuhafut al-Tuhafut was written in response to Al-Ghazali’s work. Ibn Rushd was criticized by many Muslim scholars for this book, which, nevertheless, had a deep influence on European thought, at least until the beginning of modern philosophy and experimental science. His views on fate were that man is neither in full control of his destiny nor is it fully predetermined for him. Al Rushd’s longest commentary was, in fact, an original contribution as it was largely based on his analysis including interpretation of Quranic concepts. Ibn Rushd’s summary, the opinions (fatwa) of previous Islamic jurists on a variety of issues, has continued to influence Islamic scholars to the present day, notably Javed Ahmad Ghamidi. At the age of 25, Ibn Rushd conducted astronomical observations in Morocco, during which he discovered a previously unobserved star. He was also of the view that the Moon was opaque and obscure, and had some parts which were thicker than others, with the thicker parts receiving more light from the Sun than the thinner parts of the Moon. He also gave one of the first descriptions of sunspots. Ibn Rushd also made remarkable contributions in medicine. In medicine his well-known book Kitab al-Kulyat fi al-Tibb was written before 1162 A.D. Its Latin translation was known as “Colliget”. The work composed of 7 books, concerning: anatomy, physiology, pathology, symptomatology, pharmacology, hygiene and therapeutics. In it, Ibn Rushd threw light on various aspects of medicine, including the diagnoses, cure and prevention of diseases and he made several original observations. He believed that true happiness for man can be achieved through mental and psychological health, and people cannot enjoy psychological health unless they follow ways that lead to happiness in the hereafter, and unless they believe in God. Ibn Rushd died in Marrakesh in 1198 where he was buried. Three months later, his body was moved to Cordova, his birthplace. His works remained an important influence on future great thinkers and creative minds.